The rodent left pneumonectomy is a valuable technique in pulmonary hypertension research. Here, we present a protocol to describe the rat pneumonectomy procedure and postoperative care to ensure minimal morbidity and mortality. Katz, M. G., Fargnoli, A. S., Gubara, S. M., Bisserier, M., Sassi, Y., Bridges, C. R., Hajjar, R. J., Hadri, L. The Left Pneumonectomy Combined with Monocrotaline or Sugen as a Model of Pulmonary Hypertension in Rats. J. Vis. Exp. (145), e59050, doi:10.3791/59050 (2019). In this protocol, we detail the correct procedural steps and necessary precautions to successfully perform a left pneumonectomy and induce PAH in rats with the additional administration of monocrotaline (MCT) or SU5416 (Sugen). We also compare these two models to other PAH models commonly used in research. In the last few years, the focus of animal PAH models has moved towards studying the mechanism of angioproliferation of plexiform lesions, in which the role of increased pulmonary blood flow is considered as an important trigger in the development of severe pulmonary vascular remodeling. One of the most promising rodent models of increased pulmonary flow is the unilateral left pneumonectomy combined with a "second hit" of MCT or Sugen. The removal of the left lung leads to increased and turbulent pulmonary blood flow and vascular remodeling. Currently, there is no detailed procedure of the pneumonectomy surgery in rats. This article details a step-by-step protocol of the pneumonectomy surgical procedure and post-operative care in male Sprague-Dawley rats. Briefly, the animal is anesthetized and the chest is opened. Once the left pulmonary artery, pulmonary vein, and bronchus are visualized, they are ligated and the left lung is removed. The chest then closed and the animal recovered. Blood is forced to circulate only on the right lung. This increased vascular pressure leads to a progressive remodeling and occlusion of small pulmonary arteries. The second hit of MCT or Sugen is used one week post-surgery to induce endothelial dysfunction. The combination of increased blood flow in the lung and endothelial dysfunction produces severe PAH. The primary limitation of this procedure is that it requires general surgical skills. Pulmonary arterial hypertension (PAH) is a progressive and fatal disease characterized by an increase in pulmonary blood flow, increased vascular resistance, inflammation, and remodeling of small pulmonary blood vessels1. This remodeling usually results in vascular lesions that obstruct and obliterate small pulmonary arteries, causing vasoconstriction and increasing right ventricle afterload2. Few successful pharmacological treatments of PAH exist; as a consequence, PAH-related mortality remains high. Recently, the focus of research on the pathobiology of pulmonary hypertension has moved towards a mechanism of angio-proliferation in which the role of increased pulmonary blood flow is considered as an important trigger in the development of pulmonary vascular remodeling3,4. Animal models of pulmonary hypertension have provided critical insights that help to explain the pathophysiology of the disease and have served as a platform for drug, cell, gene, and protein delivery. Traditionally, the chronic hypoxia-induced pulmonary hypertension model and the MCT lung injury model have been the main models used to study PAH pathophysiology5. However, they are not sufficient to produce increased pulmonary blood flow and neointimal pattern of remodeling compared to alterations described in human patients. The chronic-hypoxia model in rodents results in thickening of vessel walls with hypoxic vasoconstriction without angio-obliteration of small pulmonary vessels6. Additionally, the hypoxia condition is reversible. Thus, the hypoxia model is also not sufficient to produce severe PAH. The MCT lung injury model does elicit some endothelial dysfunction but the complex vascular obliterative lesions found in humans with severe primary PAH do not develop in the rats2. Additionally, MCT-treated rats tend to die from MCT-induced lung toxicity, veno-occlusive liver disease and myocarditis rather than from PAH2. Finally, the pneumonectomy alone is not sufficient to produce neointimal lesions in the small pulmonary vessels in a short period of time. After the pneumonectomy, there is minimal elevation in pulmonary arterial pressure7. In humans, the pneumonectomy is well tolerated when the contralateral lung is healthy7. However, the left pneumonectomy procedure combined with MCT or Sugen is advantageous since it mimics increased pulmonary blood flow and results in pulmonary vascular remodeling comparable to severe clinical PAH. The pneumonectomy is performed on the left lung, which has only 1 lobe, rather than on the right, which has four lobes. If the right lung was removed, the animal would be unable to compensate for the respiratory insufficiency. In the pneumonectomy-MCT model, neointimal pattern of remodeling develops in over 90% of operated-animals treated7. Similarly, the combination of Sugen and pneumonectomy results in severe PAH, characterized by angio-obliterative vascular lesions, proliferation, apoptosis, and RV dysfunction8. The left pneumonectomy procedure is also advantageous compared to other surgical procedures to induce PAH. Previously described models in rats to increase pulmonary blood flow to the lungs include the aorto-caval shunt or subclavian-pulmonary artery anastomosis. These models are extremely complicated7,9,10,11. To perform an aorto-caval shunt, the animal's abdomen has to be opened. The shunt is placed in the abdominal aorta, which increases blood flow to all abdominal organs instead of just the lungs, thus, PAH takes much longer to develop. Additionally, it is difficult to determine the blood flow through the shunt, whereas with the pneumonectomy the blood flow to the remaining lung doubles. The subclavian-pulmonary artery anastomosis also has many complications. The flow of arterial blood into the vein can lead to thrombosis of anastomosis and bleeding. Like the aorto-caval shunt, it is difficult to determine the blood flow through the anastomosis. Furthermore, it is an expensive and difficult technique that requires vascular surgical skills. The unilateral left pneumonectomy doubles blood flow and shear stress in the contralateral lung and, in combination with MCT or Sugen, causes the typical hemodynamic and histopathological findings of PAH which is endothelial cell damage8,12. The novelty of this manuscript is presented in the very detailed and comprehensive surgical protocol of the left pneumonectomy in rats and in the discussion of the technical and physiological challenges of these models. Because this protocol is not currently available, many investigators believe the model is too difficult use. Investigators who have performed the left pneumonectomy have faced high mortality and morbidity rates associated with the unnecessary loss of animals, compromising scientific assessment. Instead, many will use classical models such as MCT injection, chronic-hypoxia, or just the pneumonectomy to create PAH. However, these models are much less effective than the combination of MCT or Sugen with the left pneumonectomy. The primary purpose of this article is to provide the first detailed and reproducible surgical protocol for the left unilateral pneumonectomy in rats and provide the best surgical model of PAH. Combining this protocol for left unilateral pneumonectomy with MCT or SU5416 will allow investigators to create a far more effective and clinically relevant model of severe PAH to study the pathogenesis of this fatal disease. The procedures described below have been approved by the Institutional Animal Care and Use Committee (IACUC) of the Icahn School of Medicine at Mount Sinai. All rats received humane care in compliance with the Mount Sinai “Guide for the Care and Use of Laboratory Animals”. Autoclave Cooley-Mayo curved scissors (large scissors), straight Iris scissors (small scissors), McPherson-Vannas Iris scissors (back scissors), Wangensteen tissue forceps (atraumatic forceps), Gerald tissue forceps, plain wire speculum (self-retaining retractor), small vessel cauterizer, gauze, double-ended probe, thin vascular needle holder, and Micro-Jacobson mosquito hemostatic forceps (mosquito). Administer a subcutaneous injection of buprenorphine analgesia (0.1 mg/kg) in 6–8 week old male, Sprague-Dawley rats, 30 min prior to surgery. Place the rat individually in a chamber exposed to isoflurane 4% and oxygen (1 L/min) for 3–4 min until the rat is properly anesthetized (i.e., unconscious, breathing slowly, and unresponsive to touch or sound). Remove the rat from the chamber and tape the rat to a board so the rat lays flat on its back, with the mouth at the edge of the board. Use string to hold the rat by the two front teeth so that the neck remains flat/straight. Place a fiber optic goose light source above the neck over the larynx, lift and hold the tongue with fingers, and move the epiglottis up to visualize the vocal cords. The trachea should be brightly lit behind the vocal cords; adjust the position of the light until the trachea is bright. Intubate the rats by inserting a 16 G catheter into the larynx within 60 s of removing the rat from the chamber as they wake quickly. If the rat wakes before successful intubation, put the rat back and repeat. Immediately connect the rat to the ventilator to resume isoflurane and oxygen delivery. Confirm the intubation using a cold mirror to observe condensation of the humidity in the exhaled breath from the catheter. Make sure the animal is still breathing by the expansion of the chest. Connect the rat to the ventilator. Set the oxygen to flow at 1 L/min. Set the ventilation rate to 70 breaths/min with a tidal volume of 0.35–0.45 mL. Set positive end expiratory pressure (PEEP) to 2–4 cm H2O. Reduce isoflurane to 2–3%. Place the rat under the microscope in the right decubitus position on a heating pad at 37 °C. Tape the front legs down. Shave the left thorax behind the front leg until the end of the rib cage with clippers. Clean the surgical area with gauze and 10% povidone-iodine solution, followed by 70% ethanol (three times). Place the pulse oximeter on the rat’s foot and monitor the heart rate and oxygen saturation throughout the surgery. Heart rate should be between 200–500 bpm and oxygen saturation should be >95%. Visualize the surgical area under the microscope. This must be done first because the microscope cannot be adjusted once the environment is sterile. Put on sterile, surgical gloves. Do not touch anything besides the sterilized instruments, the surgical drapes, and the surgical area of the rat’s body. Place a sterile drape over the rat’s body and on the instrument tray to create a sterile environment. With sterile gloves, place sterile instruments on the sterile instrument tray. Use Cooley-Mayo scissors and Gerald tissue forceps to cut a small hole in the surgical drape. The hole should be about 2–3 cm in diameter to fully visualize the incision but not too large so that only sterilized skin is exposed. Make a 2 cm long lateral incision in the left thorax using a surgical blade. Use gauze and the electrocautery pen to manage bleeding/maintain hemostasis. Use the Cooley-Mayo scissors to cut each layer of tissue until the ribs and intercostal muscles are exposed. Use the mosquito to make a hole through the muscle of the third intercostal space. Use the double-ended probe to move the lung out of the way to visualize the pulmonary artery. The investigator may enter another intercostal space if the pulmonary artery is not accessible. Use iris scissors and McPherson-Vannas iris scissors (back scissors) to open the intercostal muscles to about 1–2 cm. Use the electrocautery pen to stop any bleeding. Place a small, self-retaining retractor to hold the ribs and muscles open. Open only the left pleura and move the left lung down lower in the abdomen to allow access to the pulmonary artery and bronchus. Load a medium hemoclip into the ligating clip applicator. Lift the upper portion of the left lung carefully with the Wangensteen atraumatic forceps to expose the pulmonary artery. Clip the pulmonary artery by closing the clip and applicator around the artery. Be careful not to close or rupture the left azygos vein. Do not clamp too forcefully otherwise, the vessel can rupture. Open the incision further using the tonsil to separate the muscle fibers. Load another medium hemoclip into the ligating clip applicator so that it is ready. Use the atraumatic forceps to lift the lower portion of the lung out of the incision until the left main bronchus and left pulmonary vein are visualized. Atraumatic forceps must be used pull to move the lung up and out of the incision. Since the lung is too large to be pulled out in one motion without tearing the tissue, the issue forceps are necessary to hold the lung in place while the atraumatic forceps are used carefully to pull more lung out. Ligate the left main bronchus and left main pulmonary vein together by closing the applicator around them. Do not clamp the vein and bronchus too forcefully otherwise, the vessel can rupture. Remove the lung with scissors. Be careful not to cut or tear out the clip. Use a small piece of sterile gauze to absorb any blood and make sure there is no bleeding. Before closing the intercostal muscles, insert a 16 G catheter into the thoracic cavity away from the surgical incision and into the seventh intercostal space. Make sure the investigator can visualize the needle so as not to puncture any vital organs or vessels. Immediately remove the needle, leaving the catheter in place. This will be used as a chest tube. Close the ribs and intercostal muscles with a 4-0 prolene suture. Close the skin and subcutaneous space with a running 5-0 suture (Table of Materials). Place a 5-0 suture (Table of Materials) into the skin and around the chest tube so when the chest tube is removed, the hole will be tied shut. Evacuate the air from the pleural cavity with a 3 mL syringe through the catheter to regain the negative normal pressure in the thorax. Immediately clamp the catheter with a needle holder to prevent air from going back into the thoracic cavity. Quickly remove the catheter and tie the suture to close the hole. Place the animal in the sternal position. Turn off the isoflurane but continue giving the rat oxygen via endotracheal tube. Do not leave the animal unattended at any point until it has regained sufficient consciousness to ambulate and the animal is safely in its cage. Administer 2–3 mL of sterile lactated Ringer’s solution subcutaneously. Monitor the heart rate (≈200–500 bpm), oxygen saturation (≥95%), and animal color to confirm the animal is breathing well. When the animal starts making spontaneous breathing motions and neck movements and responds to physical stimuli (such as eyes widening, nose moving, and ears responding to sound), extubate the animal by pulling out the catheter and disconnect the ventilator. Return the animal to an empty cage, away from the company of other animals. The animal should be alone for at least 3 days. For pain control, administer 0.1 mg/kg of Buprenorphine subcutaneously every 12 h for 3 days. Administer 1 mL of MCT (60 mg/kg) or 1 mL of Sugen (25 mg/kg) via subcutaneous injection, 1 week after the surgery. Seven weeks after MCT or Sugen administration, place the animal in a chamber with flowing oxygen (1 L/min) and 4% isoflurane. Connect the animal to the ventilator via nose cone. Keep oxygen flowing and lower the isoflurane to 2.5–3%. Lay the animal on his back and tape down all limbs. Shave the animal along the entire abdomen. Make an incision down the chest with a scalpel from the subclavian notch to the xyphoid. Use the tissue forceps to hold the xyphoid. Cut through the sternum with the Cooley-Mayo scissors until the heart and pulmonary artery are fully accessible. Use the electrocautery to stop the bleeding. Hold the ribs open with a retractor. Identify the pulmonary artery. Adjust the orientation of the heart, if necessary, by adding gauze underneath. Use a 20 G IV catheter to puncture the pulmonary artery between the pulmonary valve and the bifurcation of the main pulmonary artery. Advance only the 20 G catheter into the artery and remove the needle. Advance the 1.2 Fr transonic pressure catheter into IV catheter that is in the pulmonary artery. Once the PA curve is steady, record the pressure for at least 10 s. Repeat these steps to record the pressure in the right ventricle. Remove the heart and lungs. Place pieces of the lung in formalin to be fixed in paraffin and stained with hematoxylin and eosin. Systolic and diastolic RV and PA pressures and were measured with the pressure catheter in the main pulmonary artery connected to the ADVantage PV system. The mean pulmonary arterial pressures (mPAP) was calculated using the formula above. In the control group (n=20), the mean PA pressure was 18.6±1.76 mm Hg (Figure 1). In the pneumonectomy + MCT group (n=30), the mPAP increased 2.25 times more compared to the control group (41.9±2.89 mm Hg) (Figure 1). In the pneumonectomy + Sugen group (n=30), the mPAP was three times higher than in the control group (53±6.60 mm Hg). In both the MCT and Sugen groups, the RVSP was much higher compared to the control group (Figure 1). Histopathology of rat lung tissue was performed using hematoxylin and eosin staining followed by imaging with an optical light microscope. In the normal lung, there is space between the alveoli and the alveolar structures are apparent. The vessels are clear and of normal thickness (Figure 2A). In the PAH lung, there is evidence of remodeling, thickening of vessel walls, severe constriction of vessels, inflammation and focal pulmonary arteritis (Figure 2B, C). Figure 1: Severe pulmonary arterial hypertension in the left pneumonectomy combined with MCT model. Significant differences in mPAP and RVSP between the control group and pneumonectomy + MCT group and the control group and pneumonectomy + Sugen group. Data are presented as mean SEM. The p-values were calculated using a one-way ANOVA and Tukey post hoc test. Please click here to view a larger version of this figure. Figure 2: Representative photomicrographs of H&E staining of lung tissue. (A) Normal lung tissue. In the normal rat lung, the arteries (red arrow) are open and the vessel walls are normal sized. (B) Pathological vascular remodeling in pulmonary arterial hypertension rats treated with pneumonectomy and MCT. The lung shows focal pulmonary arteritis and inflammation, concentric medial thickening of the vessel walls (white arrow), and concentric intimal thickening of vessel walls (black arrow), resulting in severely constricted vessels. (C) Pathological vascular remodeling in PAH rats treated with pneumonectomy and Sugen. These lungs also show focal pulmonary arteritis and inflammation, concentric medial thickening of vessel walls (white arrow), and concentric intimal thickening of vessel walls (black arrow). The lumens of these vessels are severely constricted and/or entirely closed. Please click here to view a larger version of this figure. In PAH-affected lungs, vascular proliferation with neointimal formation and obliteration of the pulmonary arteries result in severe hemodynamic changes, right ventricular failure and early mortality7,8. The changes to the vessel walls increase resistance to blood flow, increasing arterial and right ventricular pressure. In the early stages of PAH, usually 3 weeks after administering MCT or Sugen, rats developed nonspecific histological changes like medial hypertrophy, adventitial thickening, and muscularization of the small arteries and arterioles. These changes are potentially reversible. In the later stages, about 6–8 weeks after administering MCT or Sugen, the rat's lungs have neointimal and plexiform vasculopathy that obstruct and obliterate medium and small pulmonary arteries and arterioles, cellular intimal proliferation, and concentric intimal fibrosis. Plexiform lesions usually consist of a plexus of channels lined by endothelial cells and myofibroblasts. In many cases, these changes are associated with interstitial edema and fibrosis, thromboembolic obstruction of distal small pulmonary arteries, partial recanalization of a thrombosed muscular vessels, and fibrinoid necrosis12. As stated previously, rats in other PAH models do not develop vascular obliteration of the small vessels, neointimal and plexiform lesions, and high PA and RV pressures. Treatment with the chronic-hypoxia PAH model was found to produce some thickening of vessels but the vessels remain open and there are no vascular obliterative lesions and little inflammation5. RVSP and mPAP values are slightly elevated compared to control5. Similarly, treatment with either MCT or pneumonectomy resulted in pulmonary arterial pressures that were not significantly higher than control rats and slightly remodeled vessels7,9. Conversely, we found that the left pneumonectomy combined with MCT or Sugen is an effective model to create severe PAH. Compared to the control group, the mean pulmonary arterial pressure (mPAP) and the right ventricular systolic pressure (RVSP) in rats with severe PAH nearly doubled (Figure 1). Additionally, these rats developed plexiform lesions, concentric medial and intimal thickening, thromboembolic obstruction of distal small pulmonary arteries, inflammation, and very elevated pulmonary artery and right ventricular pressures (Figure 2). Compared to the chronic-hypoxia, MCT injection, and pneumonectomy only models of PAH performed in other studies, the pneumonectomy combined with MCT or Sugen model creates a clinically relevant condition. Furthermore, this model, if performed correctly, has a nearly 0% intra-operative mortality rate and only a 10% mortality rate post-recovery from failure of the right lung to compensate respiratory insufficiency. Higher rates of either intra-operative or post-recovery mortality is usually indicative that human or equipment error has taken place. In order to successfully perform the left pneumonectomy and create PAH, there are several critical steps in this protocol that must be completed. First, it is very important to monitor the animal's oxygen saturation, capnography, and counting heart rate throughout the entire procedure to ensure the animal is breathing and his heart is beating. Monitoring oxygen saturation further confirms proper endotracheal intubation. Intubating the animal is absolutely necessary for this procedure. When the animal's chest cavity is opened, the negative pressure that normally exists in the thoracic cavity is shifted to atmospheric positive pressure. Thus, rats need to be provided with positive pressure via artificial ventilation. Without proper intubation, the animal's lungs will collapse from the positive atmospheric pressure. The surgical incision has to be made laterally or posterolaterally and in the third intercostal space. Depending on the rat's anatomy, the surgeon may have to open a different intercostal space in order to access the lung and visualize the vessels. Using other approaches will make it very difficult to reach the left pulmonary artery. When opening the chest cavity, it is very important to use an electrocautery pen to stop bleeding from the skin, muscles, and surrounding vessels. If the investigator skips this step, the animal will lose blood and less oxygen will circulate. The incision must be a minimum of 2 cm long so that there is enough space to take out the entire lung when ligating. Otherwise, the investigator will tear the tissue when trying to remove the lung from a small opening. It is also essential to use atraumatic forceps when moving the lung in order to avoid rupturing the tissue and hemorrhaging. The pulmonary artery is closed first to prevent bleeding from manipulation of the lungs. The investigator should be very careful when ligating the vessels to avoid closing the left azygos vein or tearing the vessels otherwise, the animal will die. Additionally, it is much easier for the surgeon to use titanium hemoclips rather than sutures to ligate the left pulmonary artery, left main bronchus, and left pulmonary veins with a suture. Because the investigator has to make a relatively long incision in the intercostal space, it is necessary to close the intercostal muscles and ribs with sutures. Once the chest is closed, air has to be evacuated from the chest to restore negative pressure and it is important to prevent contralateral lung and heart distortion with a closed pneumothorax. Finally, recovery is one of the most critical steps after the rat pneumonectomy. A thoracotomy is considered a very painful surgery and analgesics are essential to promote adequate ventilation, improve lung excursions in the post-operative period, and reduce pain. Rats should be recovered in sternal position to maximize lung inflation. After 10 min, the investigator can decrease the ventilation rate to help stimulate the animal to breathe on its own and wake up. If the animal becomes cyanotic and oxygen saturation levels decrease, it is necessary to increase the oxygen, ventilation rate, and increase tidal volume to 5 mL or more depending on the capacity of the ventilator. Extubation of the rats should be done as late as possible, once the animal is fully awake. The investigator may put the extubated rat into a chamber with just flowing oxygen to further aid recovery. If the technique is executed correctly and the aforementioned considerations are addressed, performing a left unilateral pneumonectomy combined with MCT or Sugen creates a reliable model of severe PAH than MCT alone, hypoxia or other methods. When the pneumonectomy is performed correctly, the animal survives, the procedure has a short duration (15–30 min), and the investigator does not need specific vascular surgical skills. Furthermore, the investigator is able to successfully create PAH. The limitations of this method are that a thoracotomy is an invasive procedure, endotracheal intubation is required, and the investigator does need some general surgical skills. The neointimal pulmonary vascular occlusive lesions and the pronounced increases in pulmonary artery pressure similar to human pulmonary hypertension patients are evident in rats after the combination of pneumonectomy with MCT or SU5416 injection7,8,9. The present model is a reliable method to study the role of pulmonary overflow in the contralateral lung and flow-induced pulmonary hypertension. This protocol may be useful for studying other diseases. It is possible to use this model to study the compensatory growth of pulmonary tissue in the contralateral lung. This technique can also be used to study and develop treatments for right ventricular failure (RVF). Severe right ventricle hypertrophy develops in animals that develop neointimal lesions from increased arterial pressure7. RVF causes death in about 70% of patients with PAH13. 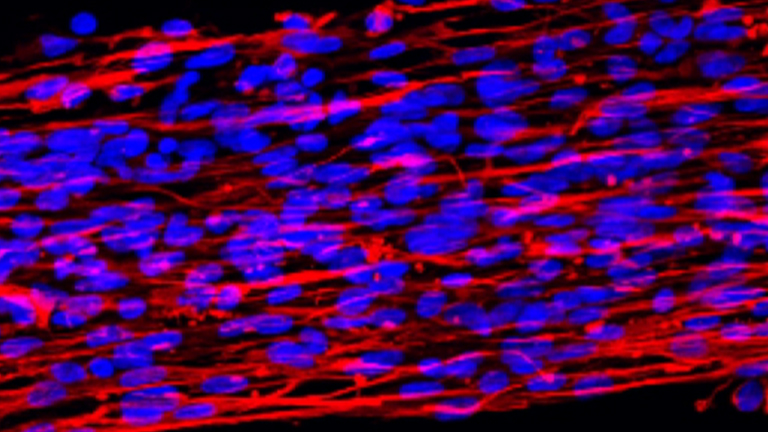 Increasing pulmonary blood flow can be useful for studying and developing treatments for patients who suffer from congenital cardiac diseases as well. This manuscript was supported by NIH grant 7R01 HL083078-10 grants from the American Heart Association AHA-17SDG33370112 and from the National Institutes of Health NIH K01 HL135474 to Y.S. and from the National Institutes of Health R01 HL133554 to L.H. Leopold, J., Maron, B. Molecular Mechanisms of Pulmonary Vascular Remodeling in Pulmonary Arterial Hypertension. International Journal of Molecular Sciences. 17, (5), 761 (2016). Gomez-Arroyo, J. G., et al. The monocrotaline model of pulmonary hypertension in perspective. American Journal of Physiology-Lung Cellular and Molecular Physiology. 302, (4), L363-L369 (2012). van Albada, M. E., et al. The role of increased pulmonary blood flow in pulmonary arterial hypertension. European Respiratory Journal. 26, (3), 487-493 (2005). Dickinson, M. G., Bartelds, B., Borgdorff, M. A. J., Berger, R. M. F. The role of disturbed blood flow in the development of pulmonary arterial hypertension: lessons from preclinical animal models. American Journal of Physiology-Lung Cellular and Molecular Physiology. 305, (1), L1-L14 (2013). Stenmark, K. R., Meyrick, B., Galie, N., Mooi, W. J., McMurtry, I. F. Animal models of pulmonary arterial hypertension: the hope for etiological discovery and pharmacological cure. American Journal of Physiology-Lung Cellular and Molecular Physiology. 297, (6), L1013-L1032 (2009). Cahill, E., et al. The pathophysiological basis of chronic hypoxic pulmonary hypertension in the mouse: vasoconstrictor and structural mechanisms contribute equally. Experimental Physiology. 97, (6), 796-806 (2012). Okada, K., et al. Pulmonary hemodynamics modify the rat pulmonary artery response to injury. A neointimal model of pulmonary hypertension. American Journal of Pathology. 151, (4), 1019-1025 (1997). Happé, C. M., et al. Pneumonectomy combined with SU5416 induces severe pulmonary hypertension in rats. American Journal of Physiology-Lung Cellular and Molecular Physiology. 310, (11), L1088-L1097 (2016). Tanaka, Y., Schuster, D. P., Davis, E. C., Patterson, G. A., Botney, M. D. The role of vascular injury and hemodynamics in rat pulmonary artery remodeling. Journal of Clinical Investigation. 98, (2), 434-442 (1996). Nishimura, T., Faul, J. L., Berry, G. J., Kao, P. N., Pearl, R. G. Effect of a surgical aortocaval fistula on monocrotaline-induced pulmonary hypertension. Critical Care Medicine. 31, (4), 1213-1218 (2003). Linardi, D., et al. Ventricular and pulmonary vascular remodeling induced by pulmonary overflow in a chronic model of pretricuspid shunt. Journal of Thoracic and Cardiovascular Surgery. 148, (6), 2609-2617 (2014). White, R. J., et al. Plexiform-like lesions and increased tissue factor expression in a rat model of severe pulmonary arterial hypertension. American Journal of Physiology-Lung Cellular and Molecular Physiology. 293, (3), L583-L590 (2007). Samson, N., Paulin, R. Epigenetics, inflammation and metabolism in right heart failure associated with pulmonary hypertension. Pulmonary Circulation. 7, (3), 572-587 (2017).